The cooperation represents the latest effort by Alibaba to help Malaysian businesses seize global cross-border trade opportunities by taking advantage of the Alibaba ecosystem. 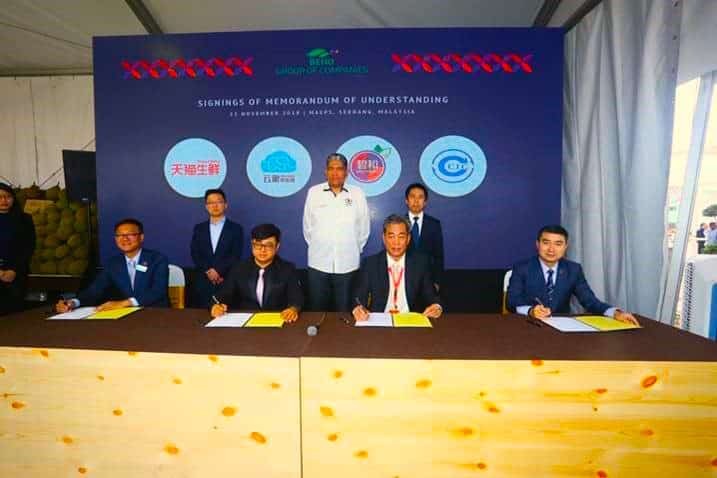 Seated L-R (signees): Haijing Leng, Leader of Tmall Fresh’s Fruit and Vegetables Sector; Jason Xiang, Senior Sourcing Manager, Win-Chain’s Import Fruit Business Unit; Ho Chung Meng, Executive Director, BEHO Group of Companies and Richy Fu, Managing Director of CCIC Group. Standing L-R (Witnesses) – Larry Chen, Chief Operating Officer, Yi Guo Group; Dato’ Mohd Sallehhuddin bin Hassan, Secretary-General, Ministry of Agriculture and Agro-based Industry Malaysia and Zhai Yi Bo, Third Secretary, Economic and Commercial Counsellor’s Office of the China Embassy in Malaysia. Alibaba Group announced today that Tmall, China’s largest B2C marketplace, and its global aggregated sourcing platform for perishable food, Win-Chain, have signed a memorandum of understanding (MOU) with Malaysia’s BEHO Fresh and China Certification & Inspection Group Malaysia (CCIC) to sell export-quality frozen whole Musang King durians to China, marking a further effort by Alibaba to harness the power of e-commerce and its dynamic ecosystem to contribute to the growth of Malaysia’s agricultural exports. Under the strategic cooperation, BEHO Fresh, a leading fruits supplier specializing in fresh and frozen durians in Malaysia, will supply Win-Chain with frozen whole Musang King durians for distribution on Tmall and Alibaba’s other China retail marketplaces, which together are visited by more than 660 million mobile active users each month as at September this year. CCIC, an independent third-party inspection company accredited by China’s State Administration of Quality Supervision, Inspection & Quarantine and the Certification & Accreditation Administration of China, will provide product traceability inspection services to ensure that the fruits supplied to Win-Chain meet China’s quality control standards. Signing the multilateral agreement at Malaysia Agro Exposition Park Serdang today were Haijing Leng, Leader of Tmall Fresh’s Fruit and Vegetables Sector, Jason Xiang, Senior Sourcing Manager of Win-Chain’s Import Fruit Business Unit, Ho Chung Meng, Executive Director of BEHO Group, and Richy Fu, Managing Director of CCIC. The cooperation represents the latest effort by Alibaba to help Malaysian businesses seize global cross-border trade opportunities by taking advantage of the Alibaba ecosystem. In July, with the support of Malaysian agencies such as the Malaysian Digital Economy Corporation (MDEC), the Malaysia Investment Development Authority (MIDA), Malaysia’s Trade Promotion Bureau and Tourism Malaysia, Alibaba launched a week-long campaign to promote brand awareness of Malaysian businesses and products on its online marketplaces with more than 50 Malaysian companies participating. In November last year, Alibaba successfully launched its first international eHub in Malaysia under the eWTP initiative, with an emphasis on facilitating exports for Malaysian SMEs and creating the infrastructure to support global trade with services encompassing e-commerce, logistics, cloud computing, mobile payment and talent training. Since then, Alibaba has made progresses on multiple fronts, including an e-fulfilment hub near the Kuala Lumpur International Airport, the opening of a local data center to provide Malaysian enterprises a local choice to build their businesses on a world-class cloud platform, external trade promotion programs and e-commerce training to develop the skills of Malaysian SMEs and entrepreneurs in support of the development of Malaysia’s digital economy.